Would you like to see the darker side of Milledgeville? Then take a ride on Milledgeville&apos;s Haunted Trolley Tour. For the past 15 years, the Haunted Trolley Tour has been entertaining residents and visitors with legends and folklore passed down for the last 150 years. This year will be no exception. Once again featuring the ever-popular "adults only" tour as well as the 6:30pm tour, the tours are certainly going to be a crowd pleaser. Sponsored by the Convention & Visitors Bureau, the tour will be haunting the residents of Milledgeville the latter part of October. We have expanded from telling stories aboard the Trolley to a fully interactive and engaging performance within the gates of Memory Hill Cemetery. We invite you to come out and take part in this annual, family-oriented event! This year&apos;s event will introduce a 7:00pm show time in order to bring the public additional "adults only" tours. The tours will be given October 26st at 6:30 and 8:30pm, on October 27th, 28th and 29th the show times will be 7:00pm and 8.30pm. 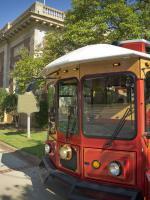 "We are extremely excited about the 15th anniversary of the Haunted Trolley Tour! To have an event become this popular and in such high demand over time is just thrilling. Our office is pleased to offer this event year after year to not just local residents but visitors from around the state of Georgia," said Office Manager, Linda Bailey. Tickets will go on sale Thursday, OCTOBER 1ST at 9am! Don&apos;t delay as tickets sale out quickly every year! Tour tickets are $15 for adults and $10 for children (under 16) and are first come, first serve. Tickets available at the CVB only. Due to the high demand, there is a maximum of four tickets per person. For more information and ticket purchase, please contact the Milledgeville Convention and Visitor Bureau at (478)452-4687 or visit us at www.visitmilledgeville.org. The CVB office is located at 200 West Hancock Street and is open Monday - Friday, 9am - 5pm and Saturday, 10am - 4pm.